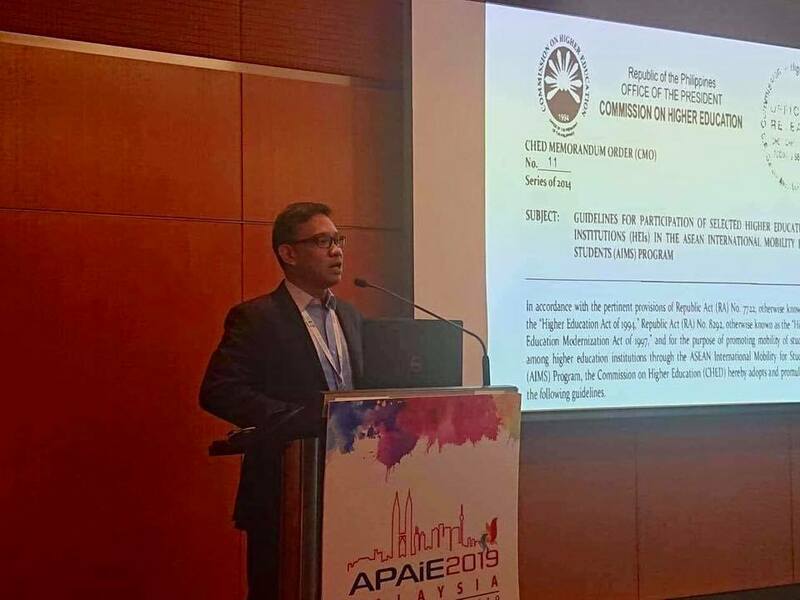 St. Paul University Philippines (SPUP), Tuguegarao City was showcased in the 2019 convention and exhibits of the Asia-Pacific Association for International Education (APAIE) at the Kuala Lumpur Convention Center, Malaysia on March 25-29, 2019. Aside from meetings for linkages and collaboration during the convention, Dr. Jeremy Godofredo Morales, (Director, International Relations) presented the "Status of the Philippine Implementation of the Asian International Mobility for Students (AIMS)" in one of the parallel sessions. Atty. Lily Freida Milla, OIC Deputy Executive Director and International Affairs Director of the Commission on Higher Education (CHED) headed the Philippine delegation which included HEI participants from SPUP, Ateneo de Manila University (ADMU), De La Salle University (DLSU), University of Santo Tomas (UST), Miriam College (MC), Holy Angel University (HAU), Central Bicol State University of Agriculture (CBSUA), Central Philippine University (CPU), West Visayas State University (WVSU), and Mindanao State University - Iligan Institute of Technology (MSU-IIT). Other PH Universities included were University of the Philippines (UP), Asian Institute of Management (AIM), Mariano Marcos State University(MMSU) and University of Science and Technology in Southern Philippines (USTP). Established in 2004, APAIE aims to encourage greater cooperation between and among institutions, to enrich and support international programmes, activities and exchanges, and to promote the value of international education across the region and beyond.